Gudrun Gut comes across as a woman without pretense. 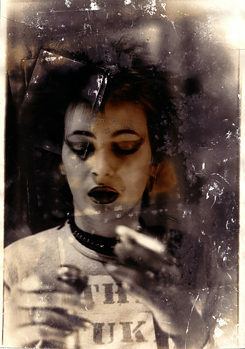 She has been an integral part of Berlin‘s music scene for over thirty years. In this interview she speaks candidly about her creative processes, the multitude of aspects in her profession and the role of women in the music industry. Gudrun, you have been active in the music scene for over thirty years now. It is quite rare to find someone who has been a part of shaping a movement - like you were during the 80s with Geniale Dilletanten – but still develops and experiments with their sound thirty years later. How would you describe your development and how do you define yourself as an artist today? © Gudrun Gut For me, it has been a long journey within the music industry. I have been moving back and forth. I realised very early on that it is about more than just the creative idea, but also about how to get the product out to the audience. I had to figure out how the studio works, how the music is being brought into the world through the label, which festivals one should play and so on. I started to pay more attention to these outside factors, to the satellites operating around the artist. An artist is not just an artist – there is more to it. That realisation is something I explored more and more. The 80s for example, were strongly determined by different bands, whilst I emancipated myself more from that during the 90s. During that time I went more in the direction of solo stuff, even though I was still working with lots of different people. By the end of 1997 I founded my label Monika and did a radio show with Thomas Fehlmann – Oceanclub Radio. This went on from 1997 until 2007, for ten years of my life, a time in which I also curated quite a lot of festivals and expanded my network. It was a little ego-centric for me though, this artist thing. Over the years you have collaborated a lot, played in various bands. I find it fascinating that it was relatively late in your career that you released your first solo-disc. Yes, it is actually kind of a pseudo-disc. I have worked with different bands, and then I did lots with Myra Davies. In that context I produced the music myself. I made various audio dramas and she wrote the texts while I was in charge of the production and music. [There have been] a couple of solo-projects. Members of the Oceanclub can be referenced as my first solo-disc, but not quite, as there were still a lot of guests on there. I still enjoy playing with others. That is great fun for me. After a solo-project I do at least two collaborations. In an interview from 1981 you describe your process of developing your sound: make noise, record it on cassette, experiment with it and refine it. What is your creative process like today? That is technically quite different, of course. I have always been open with this. Back then we did not have computers and when the first Atari came out with Cubase, Creator, Notator we from Matador left the rehearsal room and began programming. That is creatively a similar process. It is all about being able to freely develop your own thing. It is the same as if you recorded something on cassette and then selected stuff. With a computer it can be edited better in the end. That is how it went more in the direction of electro. The essence remains the same though. In the 80s you have been a part of Einstürzenden Neubauten, Mania D, Malaria! First came Mania D. We rehearsed downstairs in Blixa [Bargeld]‘s apartment. We were the first band. Blixa then founded Neubauten with Andrew [N.U. Unruh] and asked me and Beate [Bartel] if we wanted to join. We were only a part of it during that first year. To me, Mania D was the more important band. We could do our own thing way more. Then there was Malaria! We actually all had a lot of bands. Did you have any idea back then how the Geniale Dilletanten movement would be received later? Is that something one thinks about? We all find it a bit odd by the way that Geniale Dilletanten is widely being perceived as a nationwide thing. It was clearly a Berlin affair. It was a Berlin statement. If you would have told someone in the 80s in Cologne that they were Geniale Dilletanten they most likely would not have supported that sentiment. It was a festival in Berlin and the book by Wolfgang Müller is establishing the scene in Berlin a little bit. It gave a sort of frame work for what we were doing back then. While being in Australia you will be part of a panel discussion with Jasmine Guffond and Gail Priest at the Ambush Gallery in Sydney, aiming to address the theme of women in the arts. Do you think there have been changes regarding this in the music industry? I do not think there has been a whole lot of change. In the 80s in Berlin, when I started out, there were a lot of women who were doing things. That was quite variegated. For me, being around twenty, it was a time in which one thinks the world is changing and things will be different. But it did not turn out that way. In the end there were basically only guys left in the music scene. I am also an active member of female:pressure. A couple of years ago we did a narration and also various campaigns, where you just see what happens. 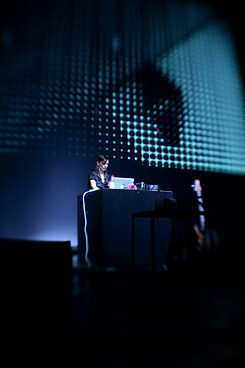 [female:pressure] is a worldwide network of female musicians in the electronic music scene. We were quite fazed actually; why we were never invited to play any festivals. If I play festivals, I am often the only woman. It is actually the case that the worldwide quota of female producers is under ten percent. That is a real catastrophe, I think. This is also being totally underestimated. There are one or two female singers in the charts and everyone believes it is all equal. But not everything is equal. Can you tell us something about your current projects? What is happening next for you? © Gudrun Gut The most current project is HAU [Hebbel am Ufer, Berlin]. All of us [the musicians involved] have adapted a Heiner Müller text into music. We have made a video and now we are performing it. I am also working on two album projects at the moment which are almost finished. One is particularly interesting, a remix-project: Folksongs from Germany. With this there are musicians from various countries involved who live in Germany, they are from Marocco, Bulgaria, Rumania, Cuba and so on. They want to nurture their roots, dig up some old songs. That is really cool. For this project I have remixed eight tracks, so basically given them my point of view. Really a fascinating project. Thank you for the interview Gudrun.